Stowe is the Ski Capital of the East. 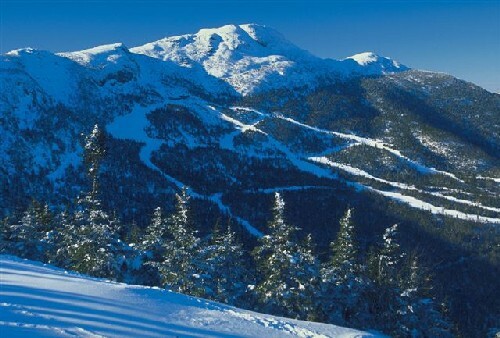 Mount Mansfield is the origin of some of the country’s first downhill ski trails and lifts. The mountain retains its history, with steep, challenging terrain and an incredible network of back-country opportunities. Stowe is also an increasingly popular summer destination, though peak visitation is during the fall, when thousands of folks enjoy Stowe’s gorgeous colors and hills. Stowe Village is a picture perfect New England town center, with a Main Street lined with shops and restaurants. Stowe is a recreational mecca. In addition to its legendary skiing, it is a growing center for mountain biking. It’s home to a ski academy, hockey academy, and world class indoor swimming and recreational facility, The Swimming Hole. 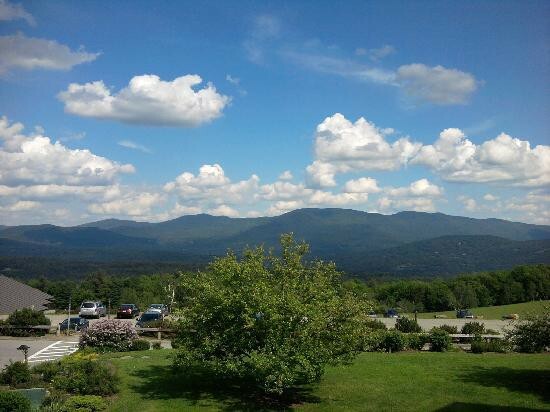 There are terrific running opportunities here, with great variety, from the 5.3 mile, fairly flat Stowe Recreation Path to some great intro trail running at Trapp Family Lodge, and a terrific network of accessible (and hilly) back roads. Runners, be aware of Stowe’s weather. Winters are very cold and trails used for running in summer are used for X-C skiing in winter. Bring your Yak-Traks. Summers are pleasant and sunny, and rarely too hot. In general, we would avoid running on Rt. 100 between Waterbury and Stowe (busy, poor shoulder), or along Rt. 108 between Stowe Village and the Mountain. Use the recreation path, which basically parallels Rt. 108. 5.3 miles ONE-WAY. MAP. Start: Lintilhac Park (behind the Stowe Community Church on Main Street in Stowe Village), which has plenty of open parking. The other end of the path is at Brook Rd. 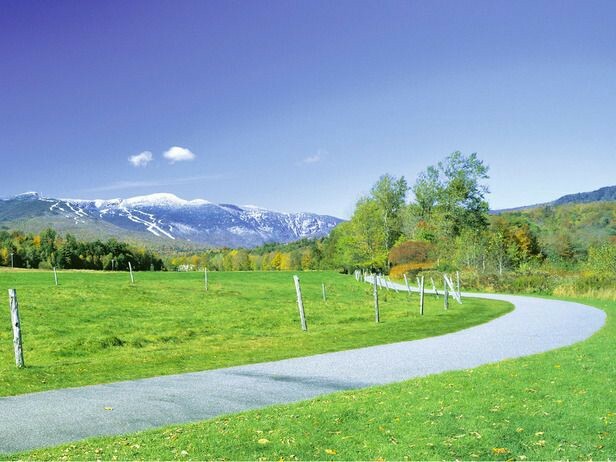 The Stowe Recreation Path is a paved public trail that is free to use and easy-to-access, with a mostly flat and level experience. 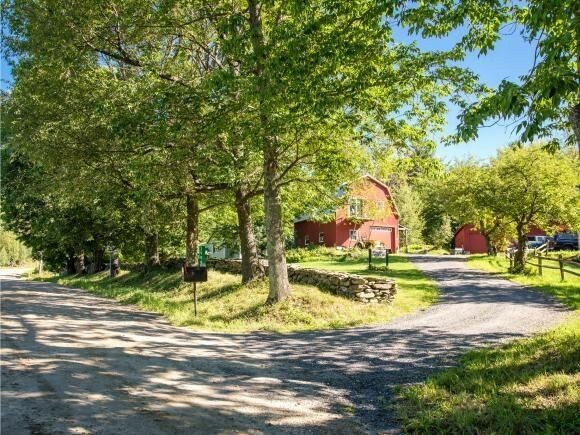 It meanders along West Branch River, past beautiful farms and through some enchanting wooded sections, with great views of Mount Mansfield. The path crosses Route 108 at several points, with well-marked cross-walks that give pedestrians the right of way. It ends at Brook Road, off 108, where you can either double back or stop into Top Notch Resort for some R&R. It is a gradual uphill headed southeast to northwest. In summer, there are lots of walkers, bicycles, and bladers. In winter, priority is for X-C skiing, but the surface is packed and can be good for running. The trail is 5.3 miles one-way. A good ‘half way’ turnaround point is the intersection of Rt. 108 and Cape Cod Rd. There are a few parking areas along the way. For one-way, slightly downhill treat, have a partner drop you at the northern terminus of the trail and run one-way to Stowe Village. This is a nice option to enjoy part of the Rec path without doing a there and back. 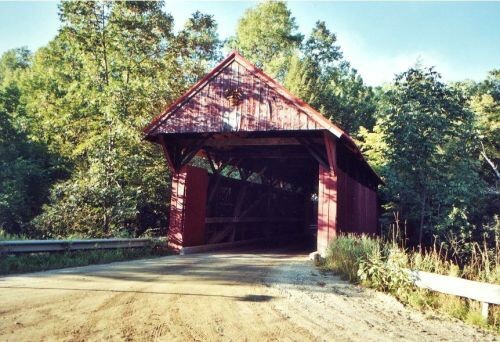 From the start in Stowe Village, follow the rec path 2.2 miles to the where it meets Rt. 108 at Cape Cod Rd. (big yellow building). Turn right on Cape Cod Rd., and keep bearing right, following the golf course, until the T at Weeks Hill Rd. (no sign). Right on Weeks Hill Rd., and a slight downhill to where the road meets the rec path, at the Swimming Hole. Left along the Rec path for the ~1 mile return to the start. 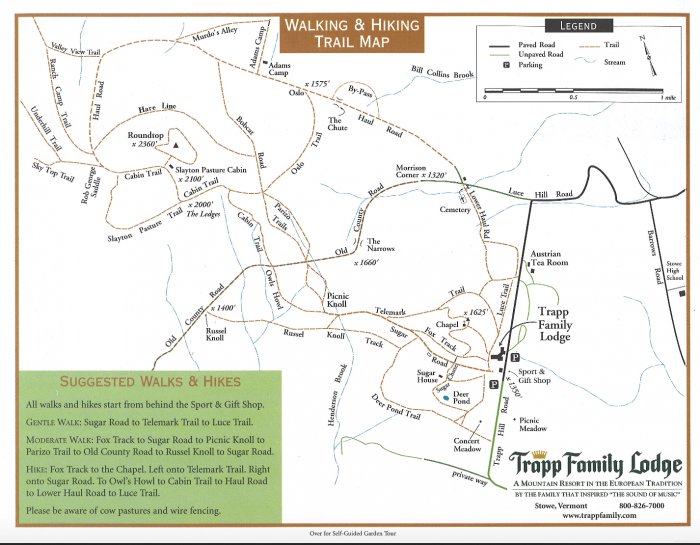 In the fall, yellow, orange, and red foliage blanket the Trapps trails and crunch underfoot making it ideal for breathtaking fall runs. The frequent twists and turns of these trails keep it interesting while providing a constant change in scenery. For an easy run take Sugar Road to Telemark Trail then loop back on Luce Trail. A roughly three–mile ribbon of narrow trail that winds its way through a quintessential Vermont forest dense with trees and beauty. For a more moderate run, take Fox Track to Sugar Road, Picnic Knoll to Parizo Trail, to Old Country Road to Russel Knoll then head back on Sugar Road. If you would like a true challenge and want to literally run up (or down) Mount Mansfield, this is a unique opportunity. A toll road runs up Mt. Mansfield, climbing 2,540 vertical feet over 4.3 miles. A series of switchbacks makes the road ‘run-able’, but this is still very challenging — averaging a 10% grade but as much as 16–17%. The reward is great views and a sense of accomplishment. But this is only for runners who have a lot of hill running experience. Note also that this road is NOT open once ski season has started, as the Toll Road becomes a ski trail. Only recommended when road closed to cars, Nov.-May. This is a unique winter running experience. Rt. 108 goes through the notch connecting Stowe and Jeffersonville (and the Mt. Mansfield & Smugglers Notch resorts). Is is a gorgeous winding road, with views of the mountains, cliffs, and boulders and beneath 1,000-foot high cliffs that hem it down to one-lane. The top is at 2,161 feet, and the climbs are as much as 18%. I cannot recommend the notch for running in the summer because the road is very narrow and steep, with no shoulder. You can do it early, or during periods with little or no traffic. But this road is seriously steep. However, this is a a really nice spot for a winter run/walk. It is closed to cars between November and May. When there is no snow, this is a nice paved running road with no cars — s0 a real treat! The first 2 miles or so, from where the road is closed to Bingham Falls, is not too steep, and climbs about 400 feet. Past Bingham Falls, it gets seriously steep, up to 18% grade. 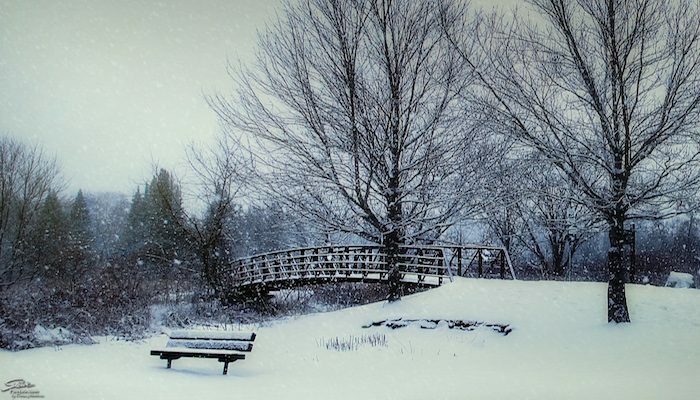 In winter, you will need some sort of traction, depending on conditions. The road is not plowed or maintained, but is often packed due to the number of walkers and X-C skiers. This is a great opportunity to get in some hills and variety in Stowe. Start at the Mountain Road and Luce Hill Road, at the Piecasso parking lot. The first 1.5 miles is a 700 foot, fairly steep climb. You’ll be rewarded with a run along Trapp Hill Rd., with great mountain and valley views. After a rewarding downhill, the return is along fairly flat Barrows Rd., going by the Stowe High School and turning right at Ten Acre Lodge, heading back down the road to Rt. 108. A great back road run. Especially pretty in autumn, as it starts at 750 feet in elevation so there are great views to the mountains and valleys. It’s also one of the runs in Stowe that is fairly open, little traffic, and all dirt roads. You will have to drive to the starting point. Park on side of road at intersection of Cole Hill Rd. and Walton Rd. This is run of ~5miles clockwise along Mud City Loop, with a brief section on Cole Hill Rd. There is some elevation, but not that much given the area. There are good options to add more or do some variety here. Cole Hill Rd., Walton Rd., and Lyle McKee Rd. in the area are all good options. Running from Stowe to the village of Moscow is a great opportunity to get some flat, continuous road running off the main road. River Rd., just outside of Stowe Village, parallels busy Rt. 100 along Little River for 2.25 miles between Stowe and Moscow. There are nice views of the river and countryside. In Moscow, there is a very small main street with a pizza place, old mill, and glass blowing studio. Moscow is home to the so-called ‘shortest July 4 parade’ in the country. There are two options for the return. An out and back, making for a 4.5 mile run. A loop option is 6.8 miles, with a 600 foot elevation gain. Take Moscow Rd. to where it intersects with Rt. 100, head south on Rt. 100 for about 0.4 miles (run on shoulder, opposite traffic), and take a right on Gold Brook Rd. Follow for about 1 mile, and at the intersection with Stowe Hollow Rd., turn left onto Covered Bridge Rd., and follow to the intersection with Stowe Hollow Rd., continuing straight onto School St. in town (elementary school, library, skating rink, playground). Stowe Hollow is one of Stowe’s more exclusive residential areas. There are numerous hilly, dirt roads to run on in this area. Stowe Hollow is one of the more exclusive residential sections of Stowe. Hilly dirt roads take you by large country estates. This is a good area for running if you like hills and dirt roads. There are two good loop options from Stowe Village. For a 4-mile loop, start School St. in Stowe Village, and take a left on Tabor Hill Rd. This is a steady climb. At the 1.4 mile mark, right on Cross and follow about 1 mile to the intersection of Stowe Hollow Rd. Follow the road for the return to School St. and Stowe Village. Enjoy some of the lovely homes in the area. Use caution in winter — can be snowy and icy. For a longer, 7-mile loop, follow the same directions but add nearly 3 miles with a loop around Upper Hollow Rd. (more fine homes), and a longer stretch along Stowe Hollow Rd. This is a challenging run: nearly 1,000 feet of elevation gain over 7 miles.